Today is a special day. 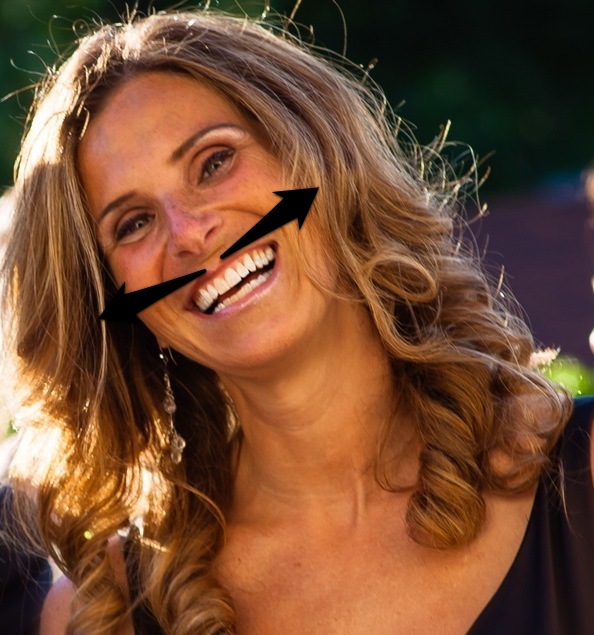 A day when chipmunks giggle more than usual, champagne bubbles float through the air, and mustache glasses sparkle like bare-chested vampires in a sunlit meadow. It’s Jules’ birthday! Go, Jules, GO! I met Jules right here on the blogs. We went from virtual friends to real life friends quickly, bonding over a mutual love of avocado egg rolls, writing and beer. 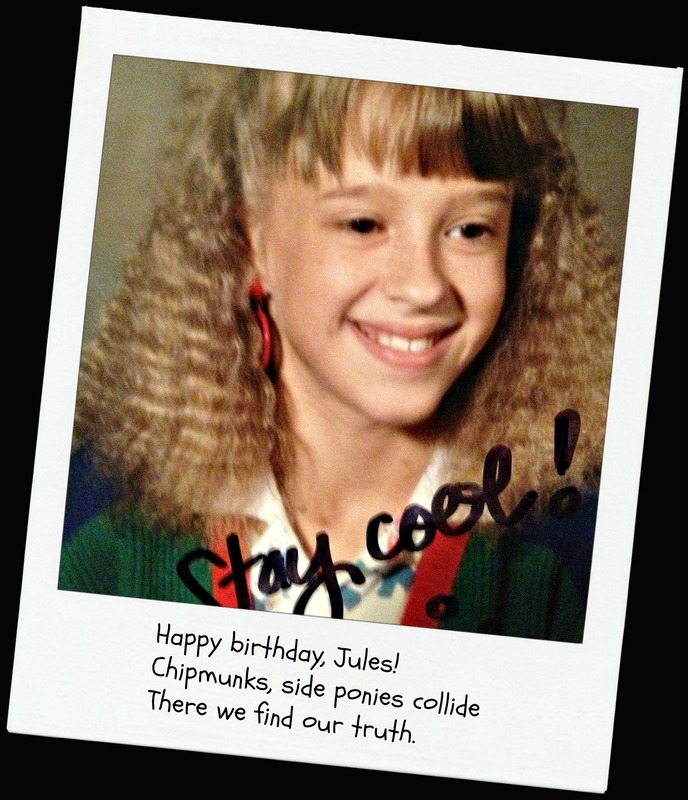 To honor her on the occasion of her birth (and to commemorate the end of National Poetry Month) her blogging buddies and I composed Jules-themed haikus (remember writing those simple, three line poems in elementary school?). 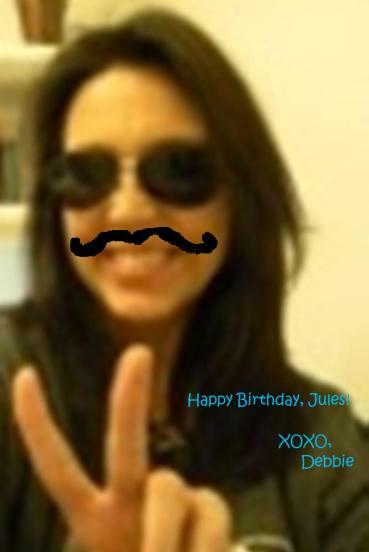 I’m raising my champagne glass and donning my blinged-out mustache glasses just for you, Jules! Let’s party! Can I have some cake? ~The Venerable Peppermeister from PEPPERMEISTER! I can think of no better way to end this post than by introducing you to the woman that started it all. 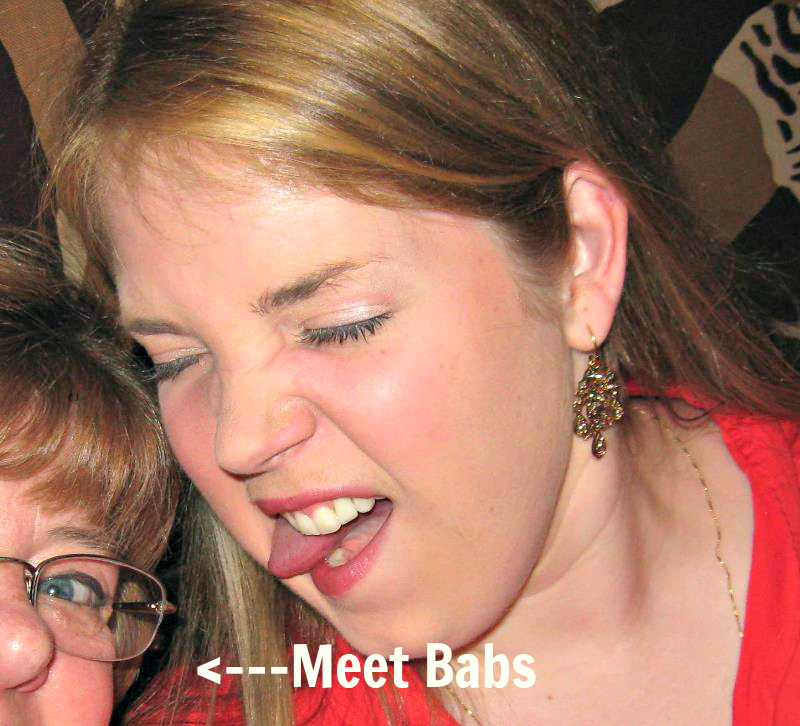 Introducing Babs, Jules’ mom and expert fitted sheet folder. . . Celebrate with us! Leave a haiku in the comments, if you wish. (It’s not hard to write one. Only three lines – first line is five syllables, second is seven, and the last is five again.) Cheers! But seriously. This is -without a doubt- one of the sweetest things anyone (anyones) has ever done for me — and I’m lucky to say, that’s REALLY saying something. THANK YOU. Excuse me while I go read this 10,000 more times and cry mop up champagne drops of happiness. Words cannot express my joy. Thanks, “Debbie”! It was such fun. Thanks for contributing! Don’t waste a drop more champagne! 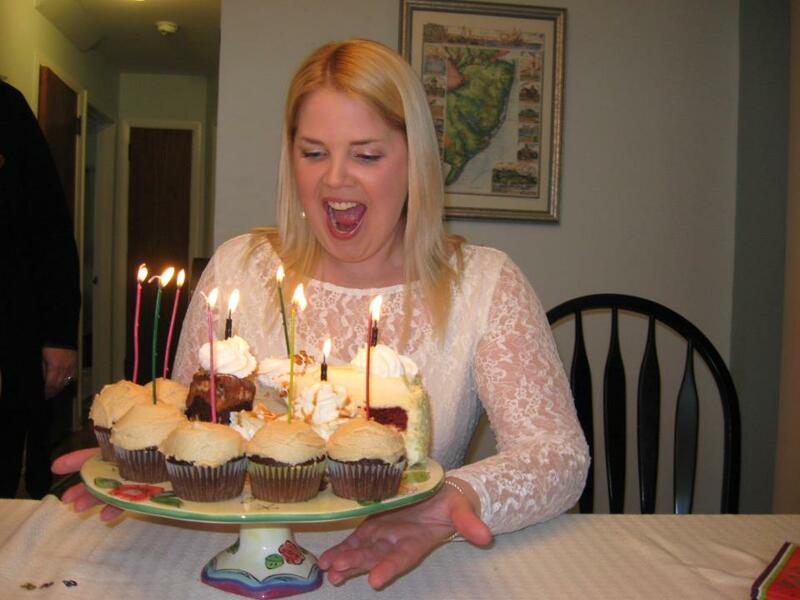 Drink up – it’s your birthday!! Wow, Rachel. What a wonderful, funny tribute! (Guess I should hope Thing 1 and Thing 2 don’t get jealous?) Thank you!! Thank YOU for the photos and the haiku! Oh, and for creating an amazing person. Yeah, thanks for sharing that great photo where Jules was getting ready to barf on you. Happy happy birthday, Miss JD!! I raise my glass to you. I wish you gals were here right now. There is all kinds of inappropriate drinking / feasting going on. Oh wait that is my stomach. Oh Jules. Only for you do I whip out the haikus. (That’s what I call my breasts. I like to celebrate in my own way, thanks!). That may be the best euphemism I’ve ever heard. I was just telling DarlyPants I wish you ladies were here. For the first time ever, I might have enough champagne (and Trader Joe’s croissants) to share! I’ll take you any which way. HAHA!! This is all kinds of awesome. I will never look at a haiku the same way again, Misty. You still rock says don. Lol, is that a Haiku?? Anyway, Jules, you’re one of the best and a sweetheart to boot. Thanks for being my blogging pal. Seeing that you have thousands doesn’t cheapen it at all for me! 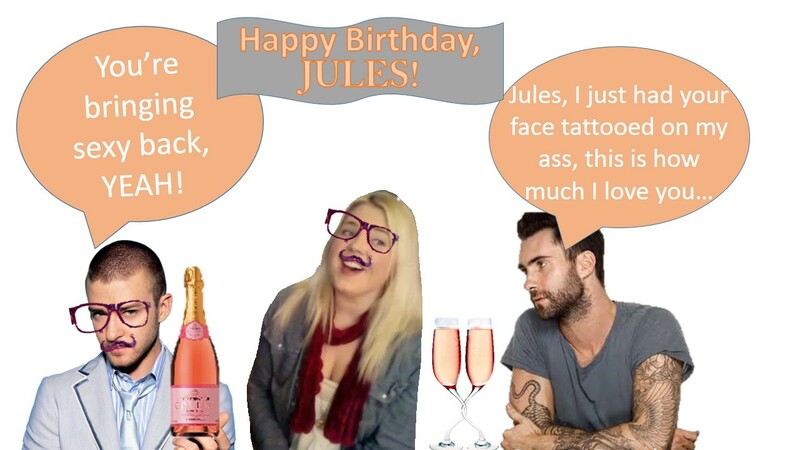 Happy, happy day Miss Jules! 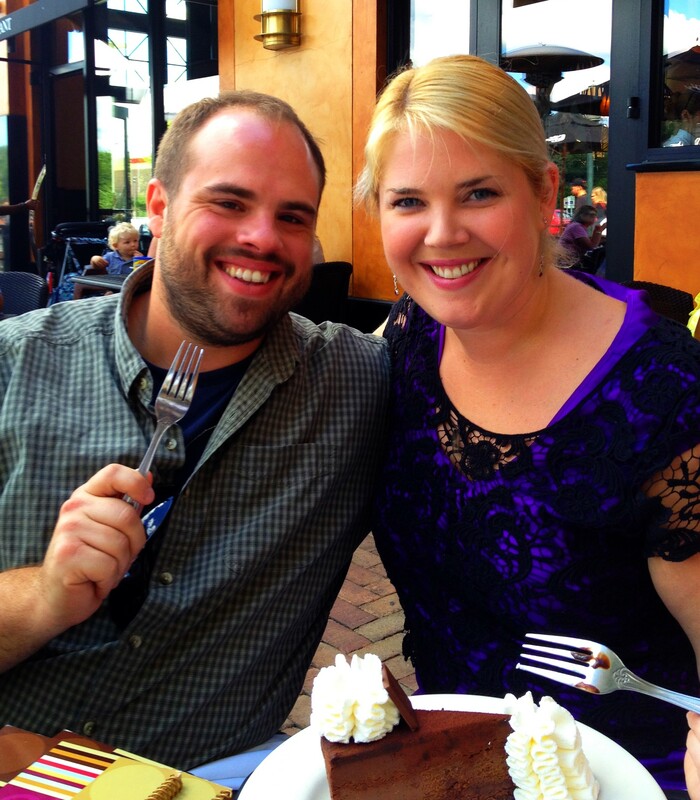 You’re a breath of fresh air around the blogosphere and I’m delighted to call you friend. Thanks for putting this together Rachel. But writing a haiku was hard. Really, really hard. When I took social studies we studied socials, so I don’t know nothing about poetry. 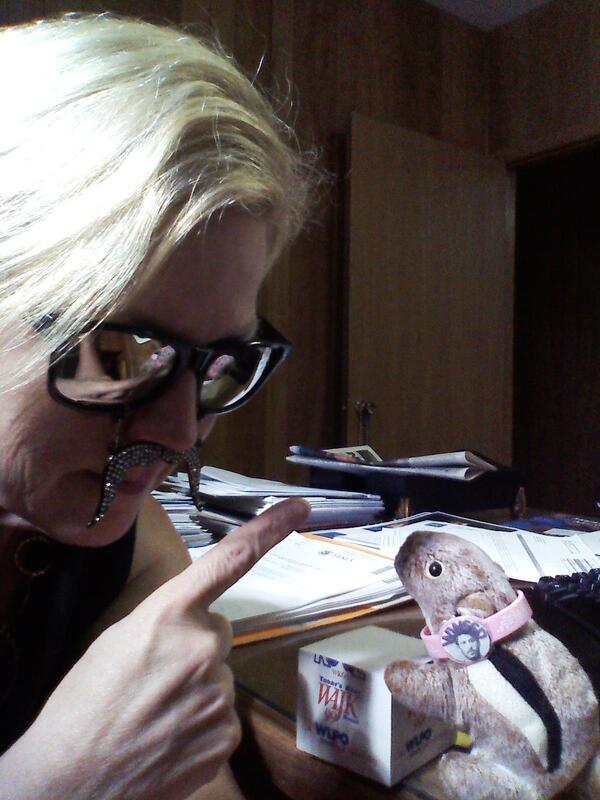 You have a chipmunk at work. Rachel, you are the best a friend could ever ask for. What an inspiring compilation of haikus! Here’s mine, late in usual fashion. Jules, Rachel — May your friendship continue to climb to new heights in the coming years. We look forward to your future antics and expect clever posts when you do. Cheers, girls! Thank you so much, Shannon – I could not agree more! My mind has officially been blown. So sweet of you to say, Shannon. And your haiku was great too! Missing your posts, but I’m sure your garden and house reno is taking up a lot of your time. Can’t wait to “see” your garden soon. I have so very many more comments, I don’t know where to begin. Did you make all of these pics, Rachey Poo?! In PowerPoint?! Oh, have mercy. I need to sit down. 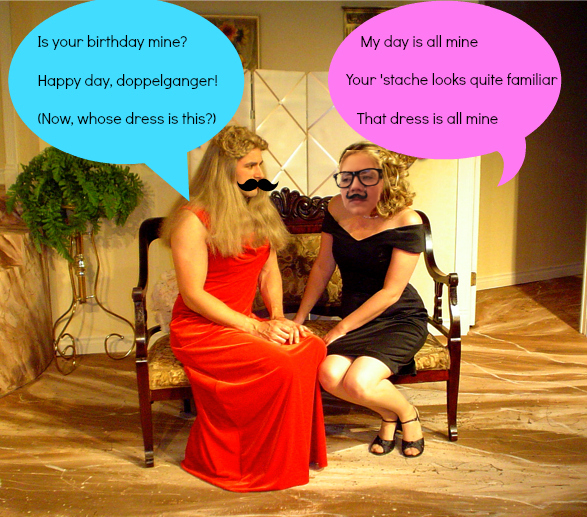 I made the Babs haiku one and the one with you and B-Man’s dress (I stole it from your blog and I hope that’s okay). I did it on Pic Monkey – picmonkey.com. 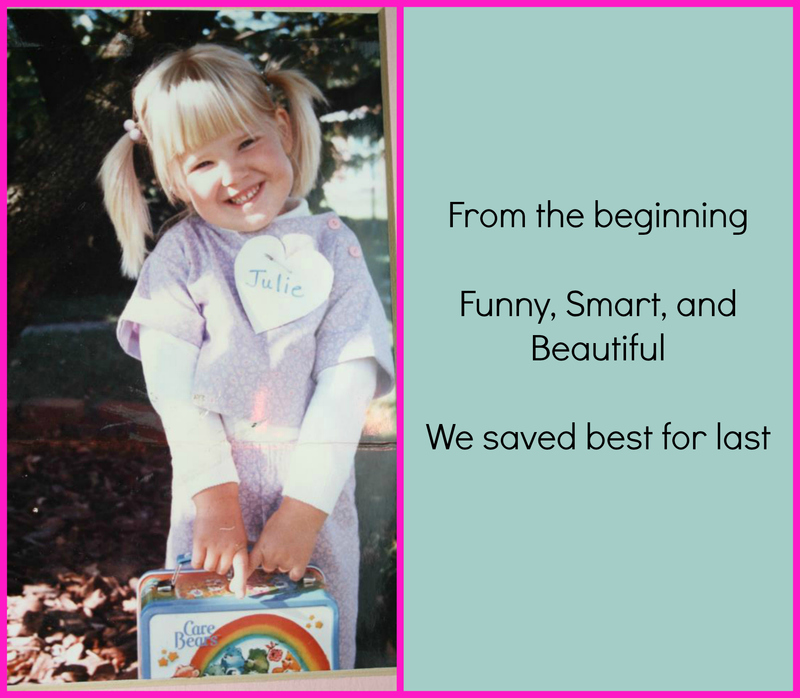 I had so much fun looking at your adorable face and Care Bear lunchbox! Everyone else submitted their own pics, including an EPIC powerpoint done by the masterful DP. Oh and I made the one for Angie too. You may recognize the photo. She’s adorbs. I like how Darla said she lost her train of thought in her haiku, because that’s what happened to me when I looked at that picture she made. I overuse “epic”, but really. This is epic. Ha! I was just telling D last night that this post was going to be EPIC. I like to be right. My brain went into this weird overdrive mode when I first read the post, where I genuinely couldn’t absorb it all. Like some of the words just wouldn’t process. Too much awesomeness. I STILL haven’t absorbed it all. I’m blushing! I’m so glad you love it, Jules! I was shocked how hard the haikus were. “Uncle Jesse” “‘stache-glasses” “chipmunk enthusiast” all these multi-syllabic words taking up valuable real estate! And the dress is mine. My replies lacked proper form. Much like solid friendships are. Look how loved you are! Meanwhile no one TOLD me we could have multiple verses in our haikus! OMG! 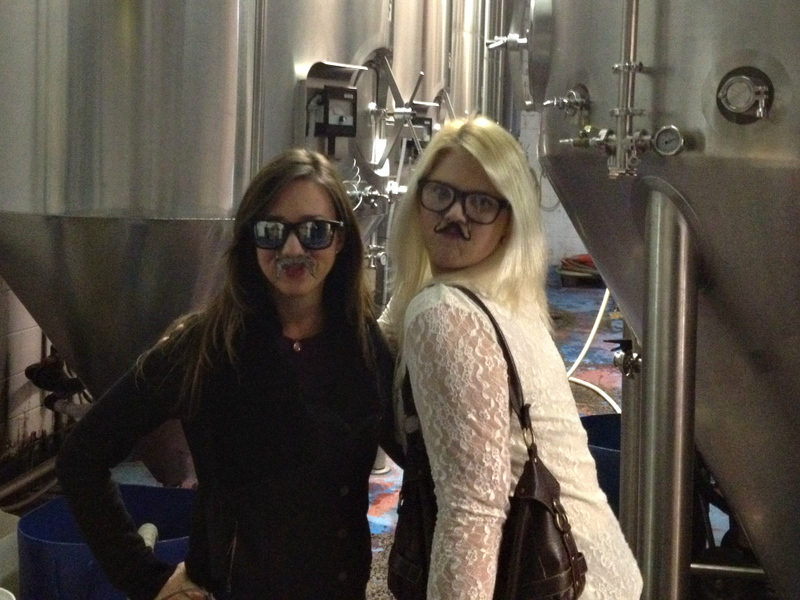 I would have gone on and on about how you are the most generous basket maker, and yet I still have no ‘stache glasses. Why not in the box? Happy b’day, darling! Hope the celebration goes on and on. You must love me less. Your haiku was very short. This was more fun than a sack of drunken squirrels. I was JUST saying that to Rachel. What is a haiku? That should’ve been my first line since that was my response to Rachel who was awesome enough to do this…what a thoughtful friend! It turned out smashing. Happy birthday, Jules! Hope you’re too drunk to read this. Do I get extra points for remembering you used to have side ponies in your tagline? Thought I’d kick it old school for ya. Do I get extra points for integrating your school photo into yet another post???? Yeeeeeesss! Thanks, Rachel….that made my day. Is it my birthday too? I will just use you. Jules, you are getting so good at these haikus. Well done. I’m sure counting syllables will have some good effect on your brain power/memory, kind of like sudoku. Angie, my dream is to acquire an original of your kindergarten photo. To talk to you yesterday. I may still be drunk. Just watch the hair, huh? Thank you so much! I couldn’t agree more! Three cheers for Rache (and by ‘cheers’ I mean ‘with booze’)!! !